There's a gritty little feature called Badsville that's been making the rounds on the festival circuit, and is now on VOD for you to enjoy. Well, as much as one can enjoy graphic violence and toxic masculinity --- however, the script has heart, and the struggles the film portrays are universal. Directed by April Mullen (Below Her Mouth), the film takes place in a crime-ridden, small town that essentially eats its young. Filmed in Los Angeles and Ventura counties, you can feel both the heat as well as the oppressive atmopshere of the place rising from the screen. 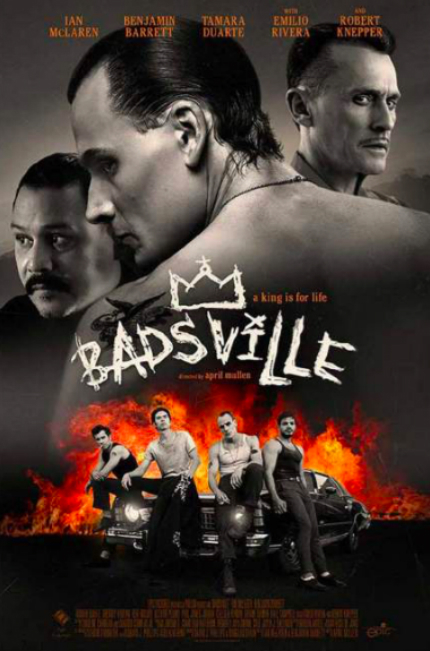 Badsville centers on the animosity and violence that perpetuates between rival gangs the Kings and the Aces. However, the story centers specifically between Wink (Ian McLaren) and his best friend, the unhinged Benny (Benjamin Barrett), both members of the Kings. (McLaren and Barrett pull double duty as co-writers of the film.) Conflict arises when Wink meets the beautiful and jaded Suzy (Tamara Duarte), and Wink decides that he wants to leave town, especially after the death of his mother. It's worth noting that Emilio Rivera of Sons of Anarchy fame has a small, but fun role as the sage bartender Lucky Lou, as well, so fans of the series will definitely want to check this one out. Badsville shines because what it's really about is the struggle to find love and to try to escape a life of crime and poverty --- to better oneself in an environment that would rather snuff you out face down in the dirt than see you succeed on any level other than a cyclical hellmouth of crime. The feature most recently won "Most Badass Feature Film" at Vancouver Badass Film Festival. It also garnered Best Director at the Canadian Film Festival for Mullen and two Best Picture awards --- both at the New York Latino Film Festival and the prestigious Oaxaca International Film Festival in Mexico. I was able to talk to Mullen about Badsville and on what it took the make the film. Check out the trailer after the interview and find where you can watch Badsville on VOD here. ScreenAnarchy: Ian McLaren and Benjamin Barrett wrote the film but also have roles in it; their very first film roles, if I’m not mistaken. Tell us about the process — the very seeds — of working with them and how the film came to be. April Mullen: Yes, it is Ian and Benny’s first film; first script and acting onscreen experience. I love working with new voices; it’s inspiring. David Philips, a Canadian producer living in L.A., had seen my work and thought I might be an interesting fit, so he sent me the script. The script resonated and I connected with the characters, style, high stakes, unique perspective, and raw violence opposite a very strong love story. After reading the script, I met with the team. I had put a visual treatment together along with some music samples to pitch my take on the film, and creatively we were instantly on the same page. I was extremely passionate about the story telling, adored and respected Benny and Ian’s intentions, and we all fist bumped and got started right away. There are plenty of real places where violence begets violence. Was BADSVILLE inspired by anything or anyone in particular? Benny, our writer and star, grew up in a town called El Monte, which was nicknamed "Badsville." It’s in California; there were a lot of gangs and violence in the town, and this inspired him. We wanted the film to be timeless, almost forgotten in time, iwth no cell phones, and hitchhiking and going bowling are the norm. We wanted the audience to focus on the characters, on their stories and development. The timeless aspect allowed for unique creative choices, with locations like Piru and Santa Clarita, with wardrobe, speech patterns, and overall --- an innocent tone smashed up against the violence. Some of the violence in the film is brutal; discuss what choices you had to make about portraying certain acts. Did you feel like you had to dial back the violence or amp it up for the story? The violence in this film stems from a place of love and protection; it is the key that motivated every fight sequence, choreographed. Every single act of violence is specific to the character and scene, and therefore they were all portrayed very differently then each other. I never dial anything back, not the violence or the love --- I always dial it up! That being said, story comes first, and the violence is there as an expression of what the character is going through. Our bodies express our inner desires, or fears; cinematically it’s thrilling to watch, because we connect to it on a human level. What challenges did you have to overcome in filming BADSVILLE? This is truly an indie film, shot in 18 days with a crew of 15-20 passionate individuals. Badsville was a highly ambitious story to tell with large location moves daily, so it was always a balancing act. It’s high-paced shooting, where you truly have to be a hundred steps ahead, yet completely in the moment with the cast and what’s on your monitor. I love indie filmmaking, it’s my roots, it’s all for the love of story telling, and creating magic together. One team, one mission! How did SONS OF ANARCHY’s Emilio Rivera get involved? Our producer Douglas Spain had worked with him before, and once he got his hands on the script, he fell in love with the story and his character. He is such a talented, kind-spirited man; he is dedicated to his craft and family. Emilio is a lover of indie cinema who supports new talent and young filmmakers. I loved working alongside him, we discovered such a strong subtext for his character, his compassion for the Kings can be seen in every frame. You’ve been touring with the film in many places; it seems particularly well-received in Canada. What have been the reactions? Overall Badsville has been adored and very well-received by audiences and critics, which is a rare combo. I feel people connect to several characters in the film; they have compassion for all of the kings, and especially to Wink and his journey. The film is full of raw, gritty violence and surrounded by love and big dreams; it’s a strong combo and story. Without spoiling the ending, was there ever a different outcome for these characters that you considered? What surprised you the most about making BADSVILLE? Also, Badsville was my first “work for hire” film; the previous films I’ve directed were all through my production company, where I am normally heavily involved in the producing aspects from concept, all the way to the poster. It was very different for me to let go of a lot of things, as I love it all so much. Either adopted or mine through birth, once I’m on board, the film takes over and all I have is sheer passion, love, forgiveness, and determination to get us there. Are there any stories from the set you’d like to discuss? I love Benny and Ian so much, it’s hard to separate them between set life and real life. They are forever locked in my mind as those incredible human begins I saw bringing their best selves forward everyday on set. The journey is so unpredictable and vulnerable, and I enjoyed working with them so much and hope to again in the future. Our producers Dave Philips and Douglas Spain were a force on set. I had my Canadian camera team there, my DP Russ DeJong and First AC Michael Fisher that made us move like butter, as we had done a few films together. The entire cast and crew were talented and we had a blast blowing up trucks, punching cars in, eating desert sand, hangin’ greaser styles, and drone dancin’! All in all, shooting was my absolute favorite time with Badsville and I’d do it all over again in an instant. What secrets! Oh…I’ll let them come find me and ask! Badsville is all heart, indie cinema at its best --- fresh voices and new stars --- check it! I just finished some work for DC Legends of Tomorrow for the CW and Imposters for Bravo, so some TV will be airing shortly. As for features, I’ll be shooting my next feature in a few months with my long-time producing partner Tim Doiron and our production company Wango Films. I'm pumped up! My last feature Below Her Mouth is also out on demand everywhere.